When you're having a rough day there is nothing that can soothe you quite like a cup of good tea can. This Tazo Tea Temptations gift basket is filled with a collection of popular teas including Passion, Chai, Earl Grey and more. All of the Tazo tea flavors are delivered with a new colorful mug, a delicious organic chocolate bar, and two biscottis to dip into the tea. 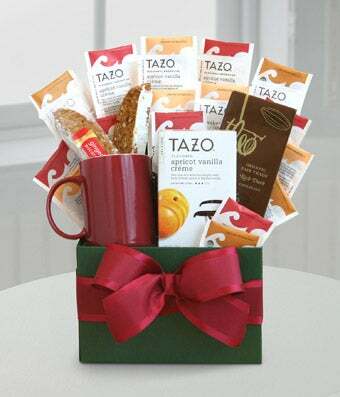 Be sure to write a note to have delivered with the Tazo Tea Temptations gift basket that is completed with a wrapped bow.